This side of the "isle"
Happy New Year! Our prayer is that this new year be filled with many blessings for you and those you love. As we begin the year, we thank you for your continuing help for our mission and for your prayers on our behalf. We promise to keep you and your intentions in ours, too. God bless you for your generous support. THIS SIDE OF THE �ISLE�: (left) KNOM volunteers Mike Nurse (pictured) and Olin Fulmer were guests of the Alaska National Guard on December 17th, as soldiers dropped off Santa Claus and lots of toys at the remote island of Little Diomede (DYE-uh-meed). It was a rare clear, calm day; usually, the weather at the isolated village is windy and stormy. In the photo, by Nome Nugget photographer Peggy Fagerstrom, you can see about half of Diomede�s 41 rugged homes. The village is located on the western side of the jagged, rocky island, only three miles from the Russian island of Big Diomede, across the Bering Strait and the International Date Line. Once a week, the out-of-the-way village is scheduled to receive a helicopter mail delivery, though flights are often canceled due to nasty weather. WHAT A CARD! Well, sort of, a greeting card over the air. During our seven-hour marathon telephone holiday greeting show, KNOM listeners sent fond wishes to thousands and thousands of friends and family members. Tom Busch anchored the entire program, and Ric Schmidt screened calls. We broadcast calls from 24 villages: for 7 of them, the calls represented 10% to 20% of all households! Beaming God�s Love throughout arctic western Alaska -- thanks to you. INSPIRATIONAL SPOT: We need prayer. We need prayer like we need air to breathe. Without prayer, we can do nothing. INSPIRATIONAL SPOT: If we do not radiate the light of Christ around us, the darkness and depression of this world will increase. The people around us must see Our Light, which is Christ, and recognize God by our union with Him. 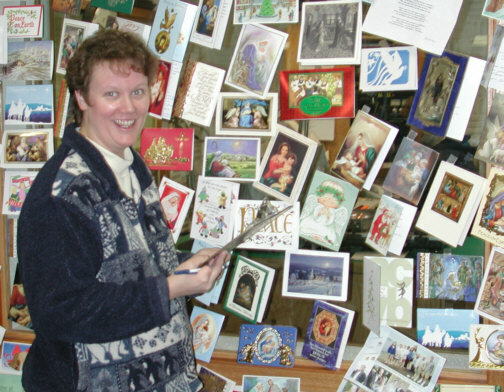 IDEAS: (left) KNOM inspirational director Lynette Schmidt pores through some of our Christmas cards, seeking spot ideas for next year. ALL-NIGHTER: December 23rd, a KNOM listener called from the village of Chefornak (cheh-FOR-nuk). The village of 408 souls is located in the Kuskokwim (KUSS-kuh-kwim) Delta, about 300 miles south of Nome. QUESTIONS AND ANTLERS: In the past few years, the city of Nome has been visited by a grizzly bear or two, a polar bear, a musk ox, and a porcupine here and there, but never in memory a moose -- until a few days before Christmas, when two of the huge animals were spotted in the center of town, á la �Northern Exposure,� as close as one block to Front Street, Nome�s main thoroughfare. Moose in this region are usually shy of humans, and old-timers were scratching their heads. RECEIPT: In the third week of January, KNOM will mail receipts to everyone who contributed $250 or more during the year 2000. We�re happy to mail a receipt to anyone, regardless of amount. Just drop us a line. THE DOCTOR IS �OUT�: January 3rd, KNOM news director Paul Korchin flew to Boston, where he will spend six months completing his PhD studies at Harvard University. Paul�s on educational leave from KNOM and plans to return in July, after earning his doctorate in ancient Middle Eastern languages. We�ll greatly miss him, and eagerly look forward to his return. WEBBED FEAT: Recently, we�ve added dozens and dozens of new and historic photos to KNOM�s web site, where you�ll also find the past 45 �Nome Static� newsletters, a brief history of the mission, a photo essay of the station�s original buildings, an index of the past three years� �Static� pictures, and lots more. INSPIRATIONAL SPOT: Everyone has inside himself a piece of good news. The good news is that you really don�t know how great you can be, how much you can love, what you can accomplish, and what your potential is. How can you top good news like that? INSPIRATIONAL SPOT: Conscience is God�s built-in warning system. Be very happy when it hurts you. Be very worried when it doesn�t. WINTER FIRE: There�s lots of snow in Nome, but to the south, the ground remains bare in many places. 120 miles southeast of Nome near the village of Kotlik, a snowmobile backfired while on dry grass and ignited a fire that burned 15,000 acres of tundra. That�s unheard-of in January. THE SHORTEST DAY (left): December 21st was foggy and snowy, but skies were nearly clear on the 17th, when this photo was taken. For a week on either side of the winter solstice, the sun rises no higher than 2.1° above the horizon. That�s about the width of your thumb, as seen from arm�s length. At high noon, a six-foot person casts a shadow 387 feet long! 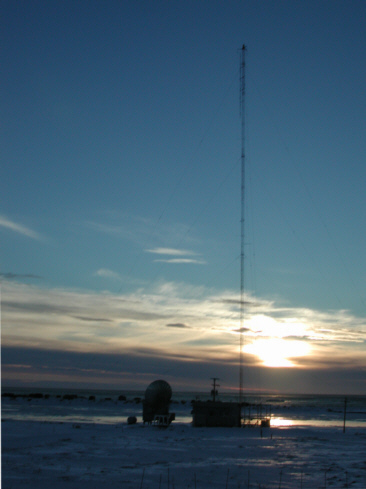 Here, at its highest, the sun�s light reflects off the frozen Nome river, with the KNOM AM transmitter in the foreground. Behind the river lies the seasonal Eskimo fish camp Fort Davis, located on a little spit of sand, and the ice of the Bering Sea. Please consider adding missions like KNOM to your will. INSPIRATIONAL SPOT: Growth begins where blaming ends, and if we have a mess, we take responsibility for it. INSPIRATIONAL SPOT: The highest form of commitment to Christ is when the worshiper not only sees God everywhere, but sees nothing which is not full of God. 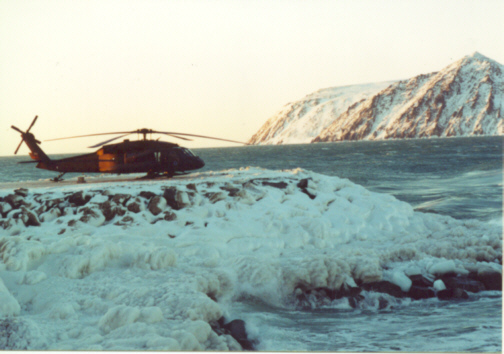 A VIEW OF TOMORROW (left): The Alaska National Guard UH-60 Blackhawk helicopter sits on the Little Diomede helipad. Looking west, you see into tomorrow across the ice and the International Date Line, with Russian-owned Big Diomede Island so close you feel like you could touch it. During the Cold War, Big Diomede was the site of a Russian military base. Although officially forbidden to do so, Eskimos from the two sides would occasionally meet on the Date Line and exchange small gifts. Thanks to the Nome Nugget�s Peggy Fagerstrom for the photo. A folded unipole uses three or more cables, suspended off the tower�s sides. Bowden�s measurement took only a few minutes. He was shocked to discover antenna characteristics that were �off the charts,� too wild for use. 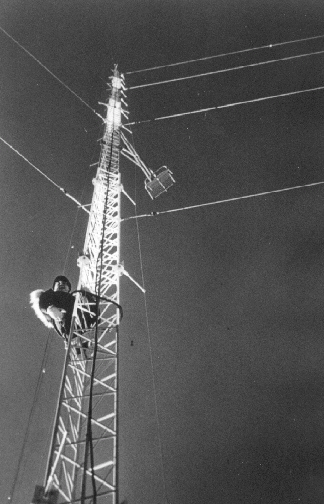 At that point, KNOM engineers Tom Busch and John Pfeifer took turns climbing the 236-foot antenna, short-circuiting the cables to the tower at various points, to improve the impedance. The process took about a month, in wind chills that were rarely above zero. Weather prevented climbing more than three hours a day, every third day or so. 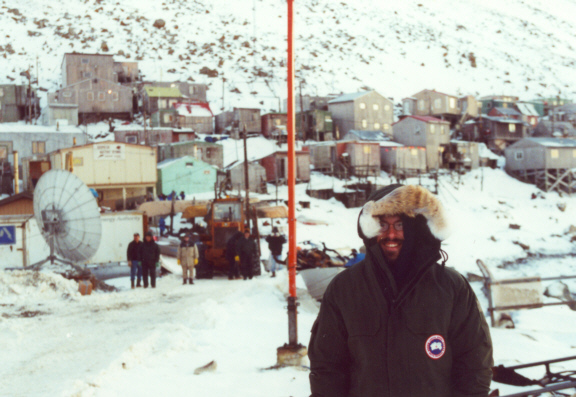 (Left) John Pfeifer begins a daily climb in below-zero temperatures. Eventually, the two located the antenna�s �sweet spot,� and secured permanent shorting wires at 157 feet above ground. Once more, thank you very, very much for your financial help and your prayers. You are the true strength of the KNOM mission, the oldest Catholic radio station in the United States. May God greatly bless you for your generosity. INSPIRATIONAL SPOT: Courage is fear that�s said its prayers.